UPDATED: Wed., May 24, 2017, 10:44 p.m. The Education Department’s top student financial aid officer, a holdover from the Obama administration, quit the position Tuesday night and sent an email to his staff warning about brewing management problems he perceived within the agency. James Runcie was appointed chief operating officer of the Office of Federal Student Aid in 2011 and reappointed in 2015, a five-year term that was slated to end in 2020. He had planned to retire by the end of the year, according to people who know him, but clashes with the new Trump administration forced his hand. The department announced Runcie’s resignation Wednesday. Runcie did not immediately respond to a request for comment. According to education officials, who spoke on the condition of anonymity because they were not authorized to speak publicly, Runcie refused Education Secretary Betsy DeVos’ request that he testify before the House Oversight and Government Reform Committee on Thursday about the department’s handling of improper financial aid payments. An email Runcie sent to his staff Tuesday night, obtained by The Washington Post, shows some of his thinking about the situation. In the email, Runcie said he declined to testify because Jay Hurt, the chief financial officer at FSA, is the expert and the point man at the agency on the subject. 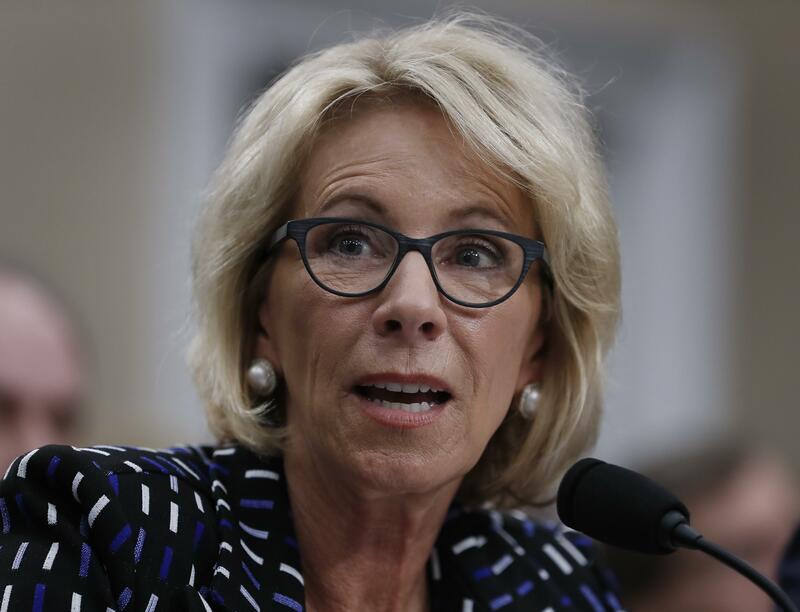 Runcie said that “the department has spent considerable time and resources to ensure (that) Jay is well prepared for the testimony” and he had not “heard a single compelling reason” from DeVos’s staff as to why he needed to attend the hearing. “In less dire circumstances, I would consider testifying as I have done on five previous occasions. However … I am incredibly concerned about significant constraints being placed on our ability to allocate and prioritize resources, make decisions and deliver on the organization’s mission,” Runcie wrote. Runcie said in the letter that the student aid office is contending with pressing projects. Among them: weighing a student-loan-servicing contract bid, shoring up cybersecurity, building out the expansion of the Pell Grant program, tending to loan forgiveness for defrauded borrowers and getting the tax-data-retreival tool in the financial aid application back online. He said his team has asked DeVos to hire staff for additional help but has yet to receive a response. Instead, Runcie said, the Trump administration has been preoccupied with transferring all or a portion of the functions of FSA to the Treasury Department. Runcie said there have been discussions about creating cross-agency teams, holding numerous meetings and retreats to determine feasibility. “This is just another example of a project that may provide some value but will certainly divert critical resources and increase operational risk in an increasingly challenging environment,” Runcie said of the Treasury collaboration. Education Department officials did not immediately respond to requests for comment. The department said in the statement announcing Runcie’s departure that Matthew Sessa, the deputy chief operating officer of FSA, will assume his duties until further notice. Under Runcie, the student aid office, which provides more than $150 billion in federal grants, loans and work-study funds to college students, has been the subject of more criticism than praise. Runcie oversaw what many consider a successful transition from bank-based federal student lending to a system in which the government is the only direct provider of federal students loans. That transition eventually turned the student aid office into one of the nation’s largest lenders as its portfolio of loans grew from $750 billion at the end of 2010 to $1.2 trillion. It also led to headaches for the office. As the portfolio mushroomed, some policy experts said the student aid office lacked the expertise to analyze student loan data and spot trouble in the portfolio. They worried that the office was incapable of identifying risks and catching borrowers before they fell through the cracks. And as student loan defaults climbed and reports of poor loan servicing surfaced, advocacy groups and lawmakers became increasingly critical of Runcie’s leadership. Audits by federal watchdogs have called into question the effectiveness and competency of the student aid office because of its management of third-party companies charged with handling student loan payments or collecting on past due accounts. A 2015 report by the Government Accountability Office criticized FSA’s instructions and guidance to loan servicing companies, which results in “inconsistent and inefficient services to borrowers.” Servicing companies complained of receiving no instructions for applying excess payments to a borrower’s account or how to handle reporting adverse credit history to credit bureaus, for instance. The GAO said the student aid office failed to consistently share information with all of its contractors. People who have worked with Runcie say he tried to reform the problems in the loan-servicing system through the new contract solicitation. Published: May 24, 2017, 10:59 a.m. Updated: May 24, 2017, 10:44 p.m.